Ever since the government announced the scrapping of high value currency notes on 8 November, bank accounts opened over the past couple of years under the Jan Dhan Yojana (JDY) have become the subject of a raging controversy. While the government spokespersons and their supporters have cited the JDY numbers to stress the universalization of banking in the country, critics have questioned the credibility of those numbers, pointing out that many of the accounts may be fictitious, and may not belong to the true and deserving beneficiaries of the scheme. Fresh data from an independent and large-scale, nationally representative survey may help put that controversy to rest. The ‘Household Survey on India’s Citizen Environment & Consumer Economy’ (ICE 360° survey) conducted this year shows that the JDY scheme has been a roaring success in getting people to open bank accounts. The survey also shows that a significant chunk of households which have access to banking still don’t use banking instruments to save or invest, which is also consistent with what the official data shows. 99% of households in both rural and urban India have at least one member with a bank account, the ICE 360° survey shows. 91% of urban households have their Aadhaar card linked to their bank accounts. The comparative figure is lower for rural India at 78%. The survey, covering 61,000 households, is among the largest consumer economy surveys in the country and captures data till July 2016. The survey shows a big jump in banking access compared to 2011, when the last census was conducted. The census showed that only 58.7% households had access to banking. It needs to be kept in mind that while the 2011 figures were based on a complete census, the 2016 figures are estimates based on a survey and hence need to be interpreted with greater caution. Nonetheless, estimates such as these based on a nationally representative survey usually provide a fair sense of the direction of change even if they under-state or over-state the pace of change because of sampling errors. 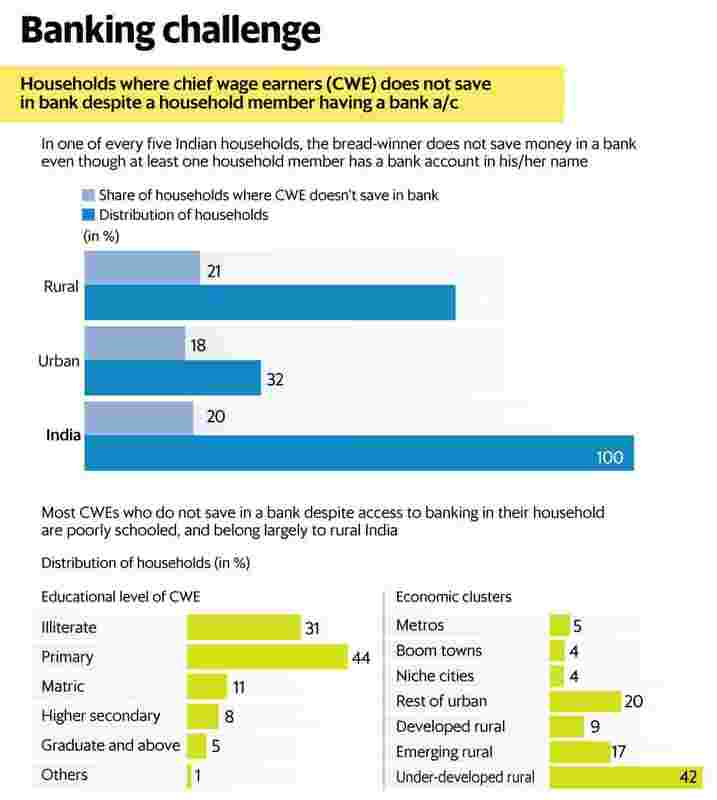 The survey also shows that in 20% of households with access to banking, the breadwinner (or chief wage earner) does not use banking instruments to save. Some of them may not be using the bank account as it belongs to another member of their household and they may not want to deposit their hard-earned money in someone else’s account. Others may be thwarted by the lack of education. A large proportion (75%) of such breadwinners are either illiterate or have just attended primary school, the data shows. This suggests that the lack of education may be a serious impediment to India’s ambitious financial inclusion agenda. A notable feature of the ICE 360° survey is that it is representative at the level of economic clusters. Urban India has been divided into four clusters: metros (population more than 5 million), boom towns (2.5 to 5 million), niche cities (1 to 2.5 million) and other urban towns (less than 1 million). Based on a district development index, rural India has been subdivided into three different clusters: ‘developed rural’, ‘emerging rural’, and ‘under-developed rural’. The first category includes districts such as Bathinda (Punjab) and Kangra (Himachal Pradesh). The second category includes districts such as Latur (Maharashtra) and Kamrup (Assam) while the last category includes districts such as Kalahandi (Odisha) and Bastar (Chhattisgarh). 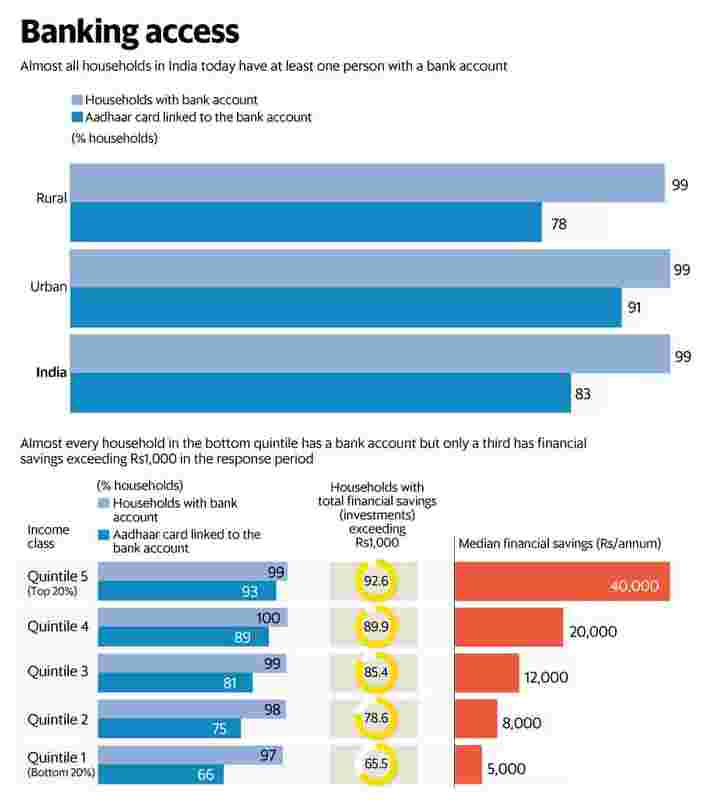 The survey shows that 42% of breadwinners who don’t use banks to save despite access to banking in their household belong to under-developed rural areas while only 5% of them belong to metros. Location seems as big a driver of banking usage as education. The survey also shows that while a greater number of people in under-developed rural areas may save cash at home, a far smaller proportion invest in physical assets (such as gold, jewellery, property etc.,) compared to other regions. Over a quarter of households in metros invest in physical assets but in under-developed rural areas, only a tenth invest in such assets. The richer income classes save much more than the poorer classes in banks but they also invest more heavily in capital markets (and/or insurance) as well as in physical assets. The survey shows that 65.5% of the bottom quintile had total financial savings (and/or investments) exceeding Rs1,000 during the response period (April 2015-March 2016). Among the top quintile, the proportion was 92.6%. The median financial savings of the top quintile is 8 times that of the bottom quintile, as per the survey. About 27% of the top quintile reported investing in physical assets but only 5% of the bottom quintile did so, the survey shows. 58% of the top quintile have purchased either capital market products or insurance. The comparative figure for the bottom quintile is just 14%, as per the survey. This is the eleventh of a 16-part data journalism series on how India lives, thinks, earns and spends, based on the latest results from the ICE 360° survey (www.ice360.in/) conducted by the People Research on India’s Consumer Economy (PRICE) in 2016. The next part will look at indebtedness levels of households.